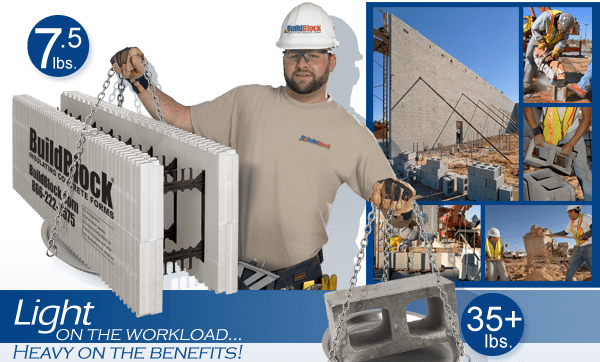 Whether you’re building a concrete home or a multi-level commercial structure, you can’t beat the rewards of building with BuildBlock® Insulated Concrete Forms. Insulated concrete forms (ICFs) are hollow foam blocks which are stacked into the shape of the exterior and load bearing walls of a building, reinforced with steel rebar, and then filled with concrete. BuildBlock® insulating concrete forms technology combines the proven strength and endurance of concrete and steel with the superior insulating properties of expanded polystyrene (EPS) resulting in structures engineered to be more energy efficient, comfortable, durable, disaster resistant, and safer than conventional construction methods. BuildBlock® ICFs are 16-inches tall and 48-inches long equating to six standard concrete masonry units. The light-weight nature of BuildBlock®; ICFs make them faster to work with while creating a much safer environment for workers. BuildBlock® Solid Monolithic concrete walls are significantly stronger than those built with concrete blocks CMU. BuildBlock® ICF structures are more energy efficient, comfortable, durable, and safer than conventional construction methods. BuildBlock® ICF walls can be engineered to bear substantially greater loads than concrete block CMU walls – vertically and horizontally. The EPS panels stay in place, creating permanent insulation and a ready-to-finish surface for brick, siding, EFIS or stucco. EPS has an R-value of approximately R-4 per inch. This is combined with the thermal mass of the concrete and the significant reduction in air infiltration to result in a performance R-Value of R-30 to R-50. BuildBlock’s® Insulating Concrete Forms built-in energy efficiency significantly reduces annual energy costs when compared to concrete block CMU structures, providing substantial savings over the life of the structure. An 8-inch BuildBlock® ICF wall has an STC of 53 without the need for additional sound mitigation materials or methods.